The Batu Caves in Malaysia are one of the most important Hindu religious sites outside of India and are a must-see once you tire of shopping and wandering Kuala Lumpur. Just eight short miles north of the city, the Batu Caves are just one of the many interesting things to do around Kuala Lumpur. The caves attract around 5,000 visitors a day who come to climb the grueling 272 steps up to the caverns. The Batu Caves are a focal point for Hindu Malaysians, particularly during Thaipusam: they house a 113-year-old temple, along with an interesting array of Hindu artwork and shrines. Every year during the Hindu festival of Thaipusam, the Batu Caves attract more than a million devotees and spectators. The eight-hour procession of music and ceremony leaves offerings before a giant statue of Lord Murugan, the Hindu God of War. 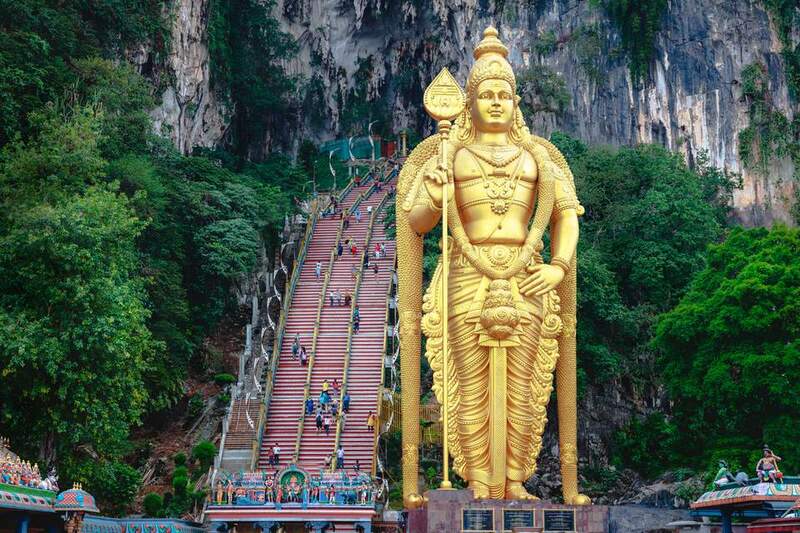 Approaching the caves, the first thing you notice is a towering golden statue of Lord Murugan. Erected in 2006, this statue is the largest in the world dedicated to the deity and stands guard to the 272 leg-burning steps that lead up to the cave entrances. As you make your way up the steps, you will undoubtedly be entertained by a tribe of monkeys that feed off the steady stream of tourists. You may take pictures, but pay attention to your belongings! Resting points along the stairs provide nice views of the suburbs of Kuala Lumpur. Batu Caves' jagged limestone hillside is home to three main caverns. The largest and most popular is known as ​Temple Cave, which has a ceiling over 300 feet high. Inside the lit cave, you will find various Hindu shrines and ornate depictions bringing legends to life. The entrance below Temple Cave is known as ​Dark Cave; this is the wildest of the three caves. The 6,500-ft underground stretch harbors brilliant limestone formations and is home to many species of cave animals including the endangered Trapdoor Spider. The Dark Cave can only be explored by booking a spelunking tour in advance. The tours require a fair level of physical fitness as some crawling is required; it is advisable to bring a change of clothes. Just across an attractive set of bridges, the Art Gallery cave contains Hindu carvings and wall paintings that depict tales of Lord Murugan and other Hindu legends; expect to pay a small fee to enter. While most tourists come to visit only the caves, the limestone hills and crags in the surrounding area offer some of the best rock climbing in Southeast Asia. Around 170 bolted routes present great climbing challenges for sport climbers. The routes, rated from 5A to 8A+, have something to offer for climbers of all skill levels. For less technical climbers, there are many opportunities for hiking, scrambling, and bouldering in the area. Expect to be entertained and possibly even harassed by a horde of Macaque monkeys that call the area home. The monkeys make great subjects for photos, but inevitably end up stealing from and even biting the occasional tourist. The Batu Caves are located in the Gombak district, a northern suburb of Kuala Lumpur just eight miles from the city center. Thaipusam in late January sees a marked increase in the buses and transportation options shuttling people to the caves and back. Option 1: Take the KTM Komuter Sentul-Port Klang line (red on transit maps) north to the newly-opened Batu Caves Komuter station. Alternatively, you can also go from Sentul station if there is further construction on the line. Option 2: Take the monorail north to the Chow Kit station. Take bus U6 to the caves and be sure to keep your ticket for the return journey (the bus tickets are valid all day). Riding a bus to the Batu Caves in city traffic can take around 45 minutes. You are better off taking a train to the north and then transferring to bus or taxi for the remainder of the trip. Alternatively, you can take bus #11 from the busy Bangkok Bank bus terminal on Jalan H.S. Lee near Chinatown all the way to the caves. A taxi from the Golden Triangle in Kuala Lumpur will cost you around RM 25. Arrange to have your driver pick you up later, or take the train back after you are finished exploring the caves. The caves are open all year from 7:00 AM to 7:00 PM. The area is not very handicap-accessible, so senior travelers may have difficulty getting up the stairs to the entrances. The wild caves are very muddy; bring a change of clothes if you plan to take any of the spelunking tours. There are stalls and restaurants offering Indian food outside the entrance of the Batu Caves. However, you should make your way back to Kuala Lumpur for better quality food at lower prices. Bring your own drinking water to avoid being overcharged. Malaysia's Independence Day Is Fun and Colorful!